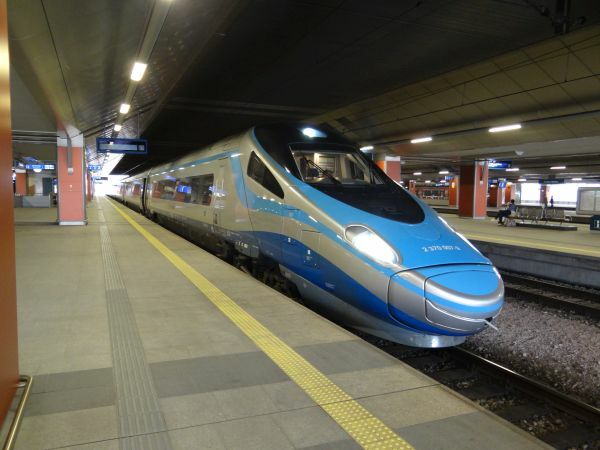 This is a class 2370 New Pendolino, built by Alstom in Italy. 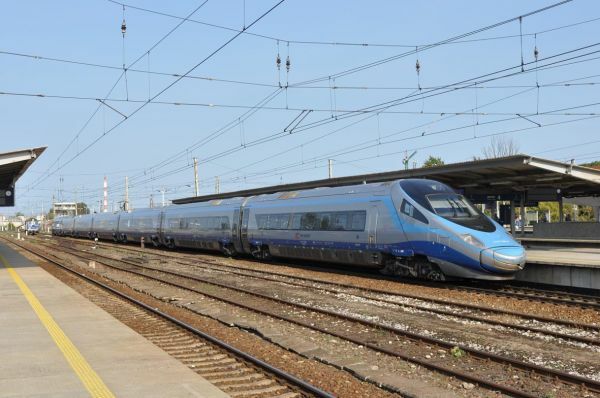 It is otherwise similar to the New Pendolinos ETR 610 which operate in Italy and Switzerland, but it lacks their active tilting mechanisms. 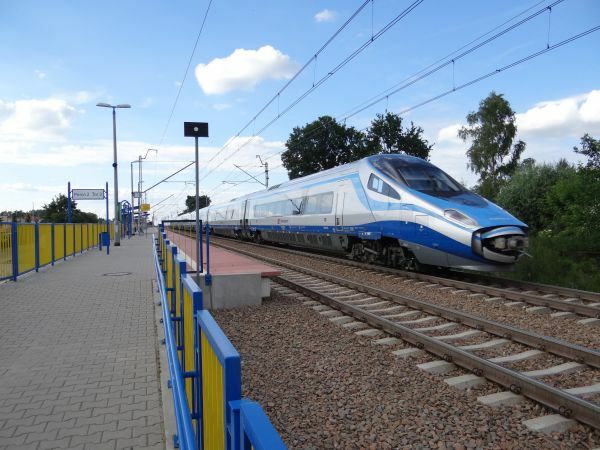 These are used now on the long fast routes, for example from Gdansk and Warszawa to Krakow. Picture at Krakow Glowny 16.4.2016 by Ilkka Siissalo. 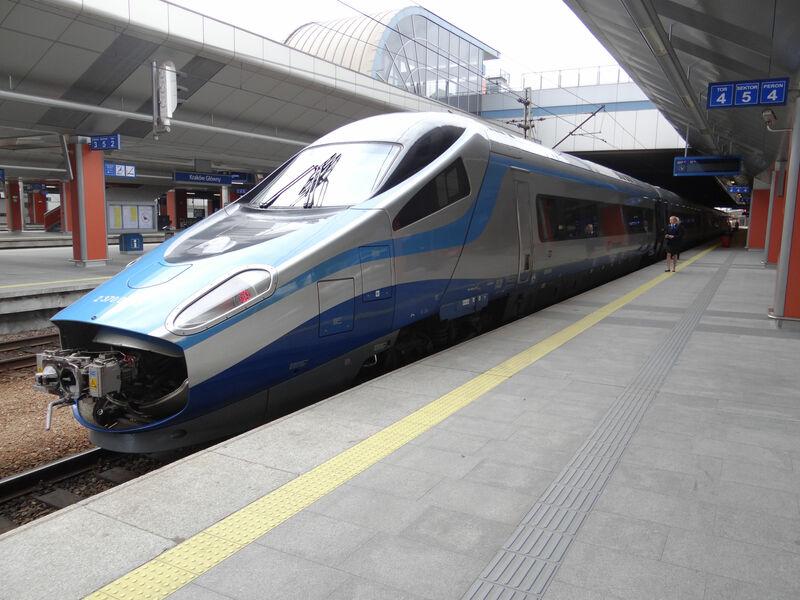 One of the PKP Intercity's New Pendolinos waiting at Gdansk Glowny (Gdansk main station) for departure towards Krakow. Picture 4.4.2017 by Ilkka Siissalo. A New Pendolino bullet train has just arrived at Krakow Glowny from Warszawa and Gdansk. Picture 16.4.2016 by Ilkka Siissalo. 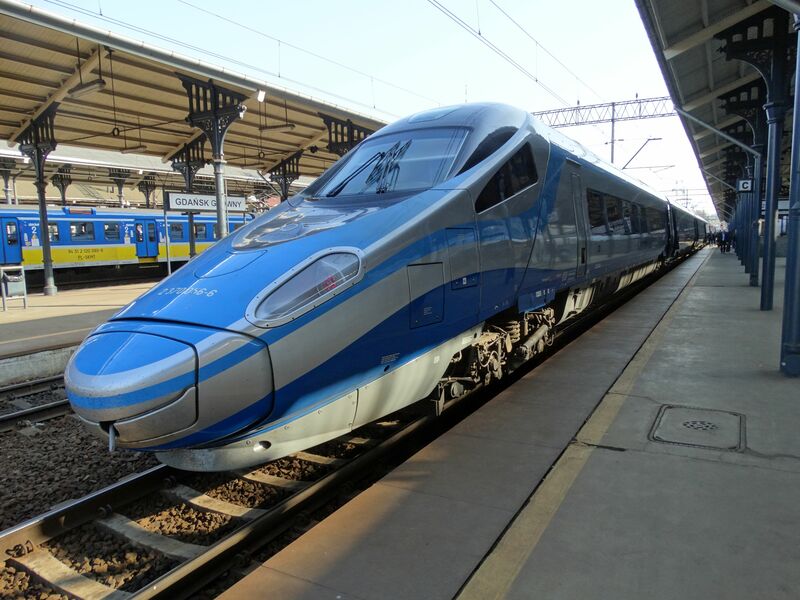 Another New Pendolino bullet train ready to leave towards Warszawa. Its "mouth" is open as another similar unit coming from Katowice will be coupled to it underway. These trains are fitted with the necessary security equipment to operate also in Germany, Austria and Czech republic under 3 kV DC, 15kV AC and 25 kV AC. Picture at Krakow Glowny 16.4.2016 by Ilkka Siissalo. Another New Pendolino on its way from Krakow via Warsaw to Gdansk and Gdynia, seen here passing the small station of Swiercze in full speed. Picture from Swiercze 27.6.2015 by Ilkka Siissalo. 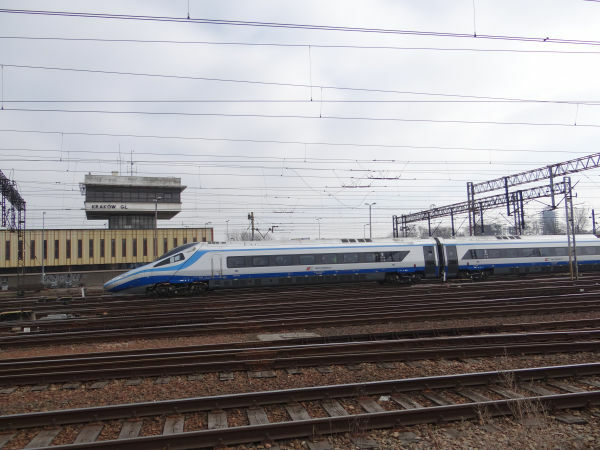 A PKP Intercity New Pendolino in full speed close to the Krakow main station. Picture 7.3.2015 by Ilkka Siissalo. Another PKP InterCity ED250 New Pendolino. Picture from the Warsaw east station (Warszawa Wschodnia) 1.9.2018 by Marek Graff. The bar coach of the same New Pendolino as shown above. 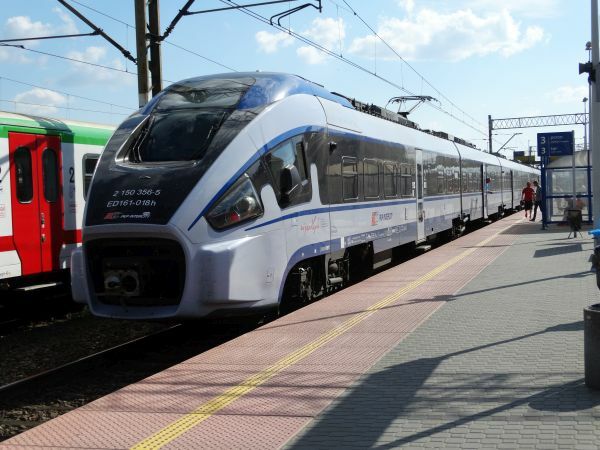 This is one of Poland's newest express trains, the ED160. 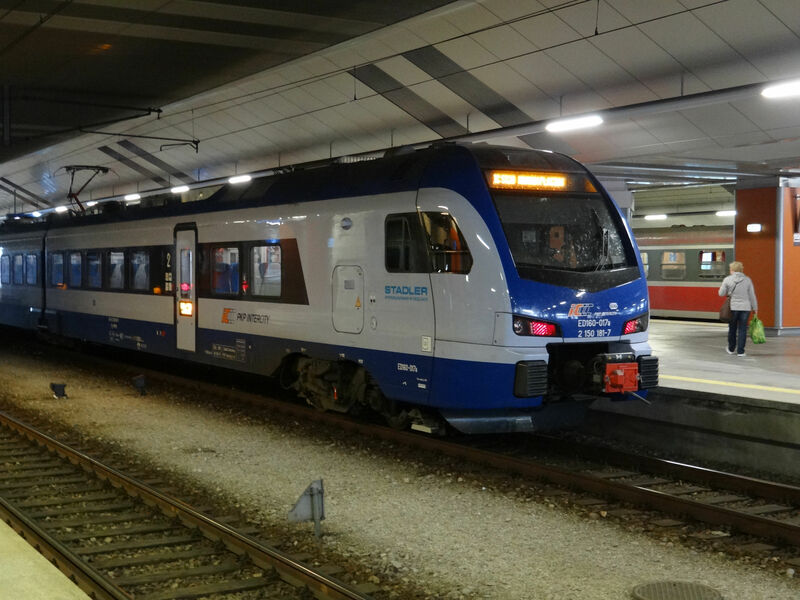 It is a 3rd generation FLIRT train from the Swiss company Stadler, but built in Poland. 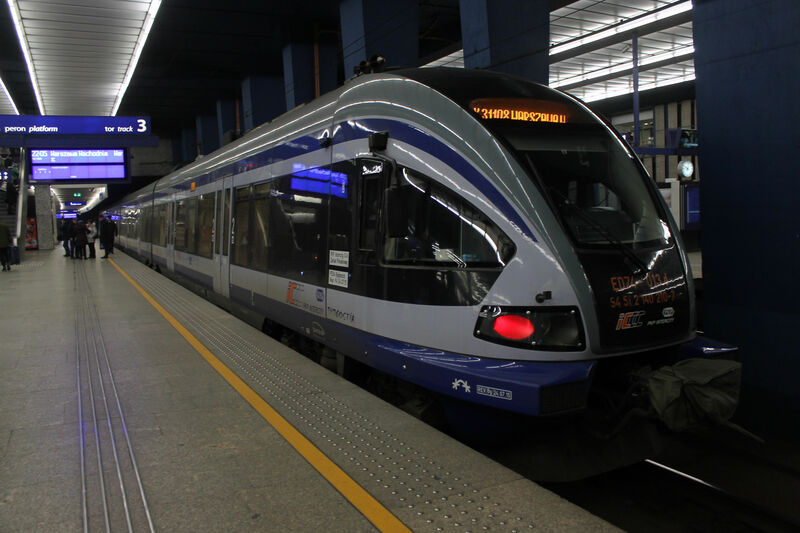 Whereas most FLIRT trains are made for regional traffic, this one is designed for long distance InterCity services. 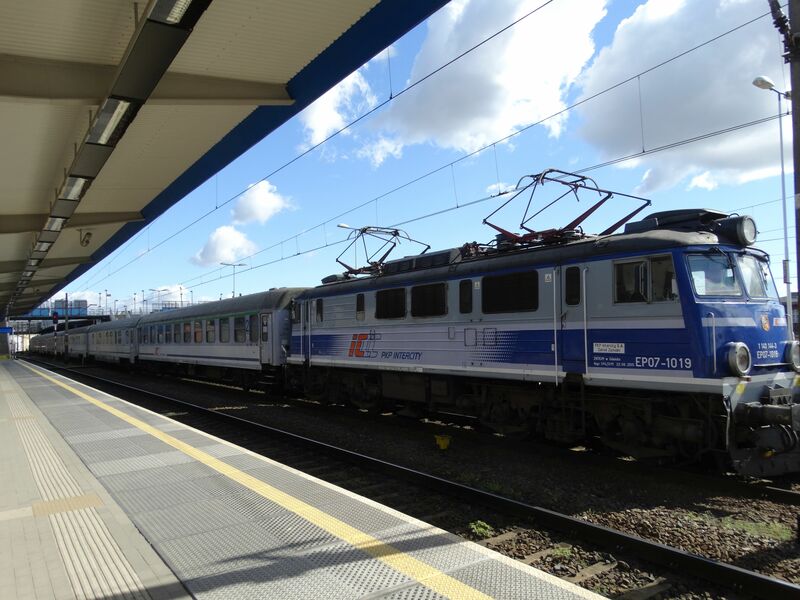 It is by far longer than the usual FLIRTs (152,90 m) and has even a restaurant coach. Picture from Krakow Glowny 16.4.2016 by Ilkka Siissalo. Another view of the same FLIRT InterCity. Whilst the traditional IC train on the right is waiting for a locomotive, the FLIRT InterCity is already ready to continue towards Krakow Plaszow, the terminus of this IC service. Picture from Krakow Glowny 16.4.2016 by Ilkka Siissalo. There it goes now. It's easy to recognise this as a FLIRT train, but to be a FLIRT it is really remarkably long. And the number of doors - only one single door per coach is also striking. Not even to mention the restaurant coach... Picture from Krakow Glowny 16.4.2016 by Ilkka Siissalo. 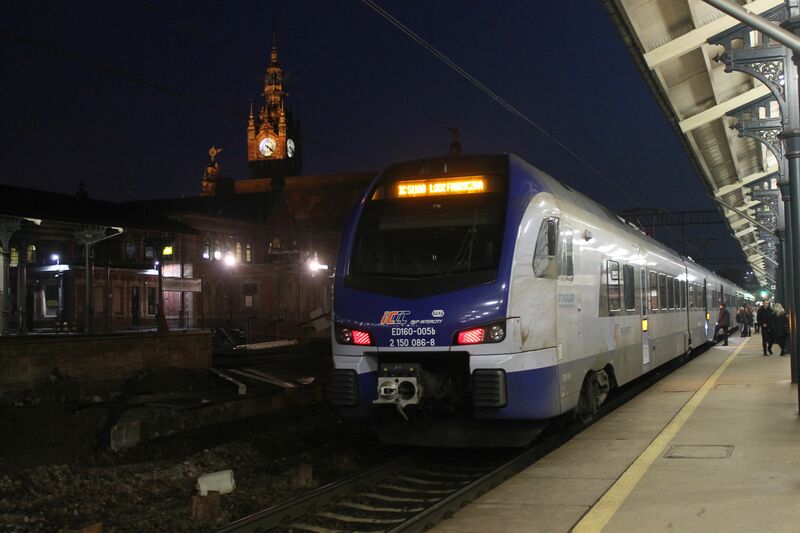 Another ED160 Intercity FLIRT in a nice night time shot. Picture from Gdansk Glowny (Gdansk main station) 27.12.2017 by Timo Varshukov. A brand new train. This is a class ED74 express train of PKP Intercity. It is a four coach electric multiple unit train built originally by Pesa in 2006 for the regional part of PKP, now called Polregio. However PKP Intercity let totally refurbish and rebuild fourteen of these trains resulting in a brand new express train type. This is one of the very first examples in commercial use. Picture at Warsaw C 16.1.2018 by Timo Varshukov. PKP Intercity bought not only Swiss Stadler's FLIRT trains but also competing products from a Polish manufacturer. 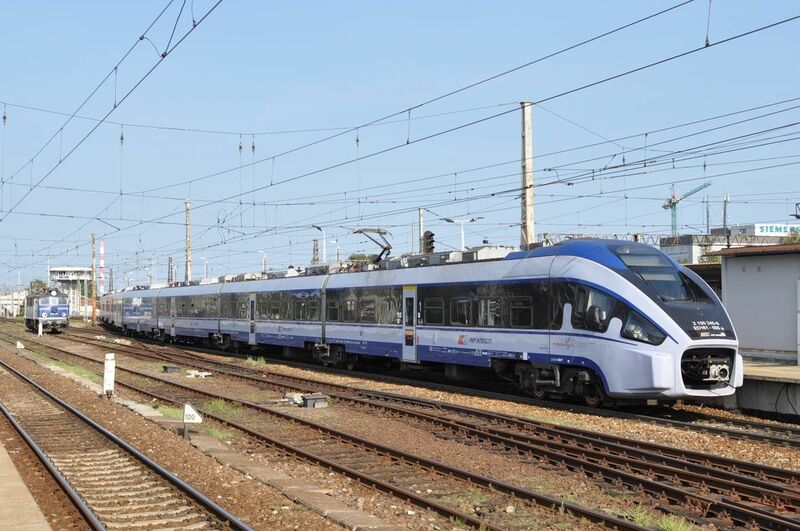 This ED161 is built by Pesa in Poland and they call it Pesa Dart. The type was first time exhibited at the InnoTrans fair in Berlin in 2016 and now it is already in commercial use. 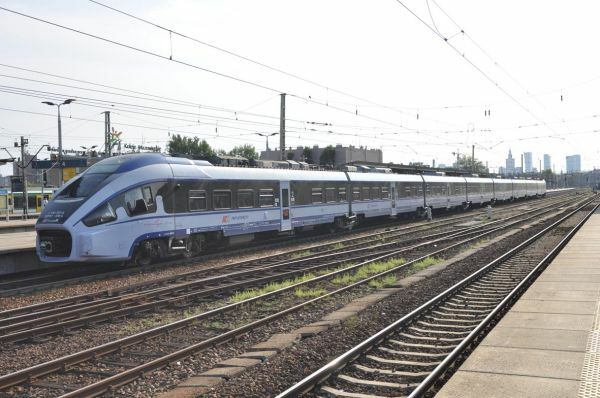 It is an eight car long fixed trainset. Picture of a Pesa Dart at Warsaw main station 28.12.2017 by Timo Varshukov. 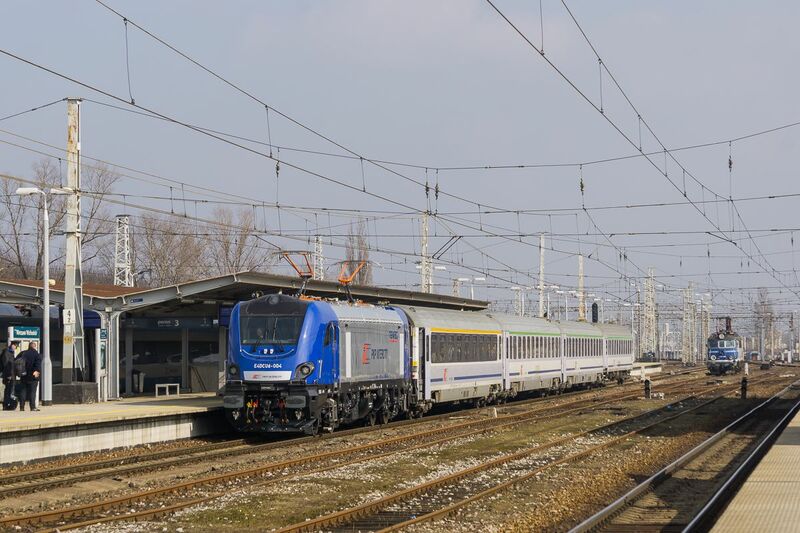 Another ED161 Pesa Dart of PKP Intercity. The same Pesa Dart as above, seen from the other side. Closeup picture of an ED161 Pesa Dart. Picture from Bialystok 29.6.2018 by Ilkka Siissalo. This is a brand new six axle diesel locomotive for fast InterCity trains, Pesa's model SU-160 called Gama. Picture at Korsze 3.4.2017 by Ilkka Siissalo. 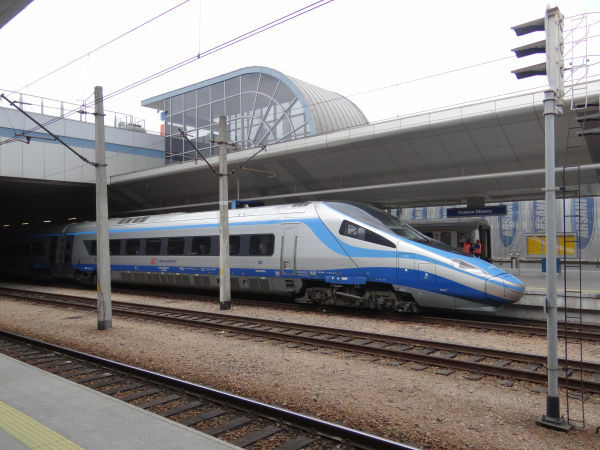 Another SU-160 Gama is bringing in an InterCity from the north to the Korsze station. The company Pesa introduced Gama locomotives in 2012 at the Innotrans fair in Germany and the first diesel powered Gama was built in 2014. 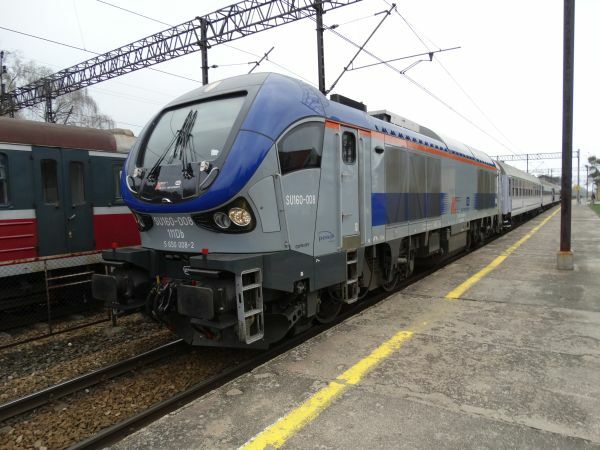 PKP Intercity took in use 10 of them. But although this is a very modern locomotive, the model has suffered from frequent breakdowns and it is not at all popular amongst the locomotive drivers. Picture at Korsze 3.4.2017 by Ilkka Siissalo. 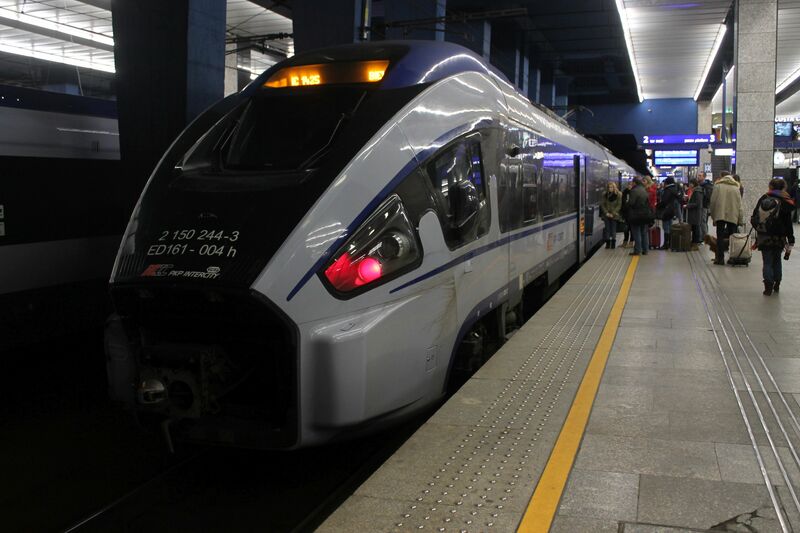 A very typical Polish InterCity train of 2017; this is the same train as above, pulled by the Pesa Gama no.005. Many of PKP's InterCity coaches are of Eastern German DDR origin, so called Halberstädter coaches. Picture at Korsze 3.4.2017 by Ilkka Siissalo. 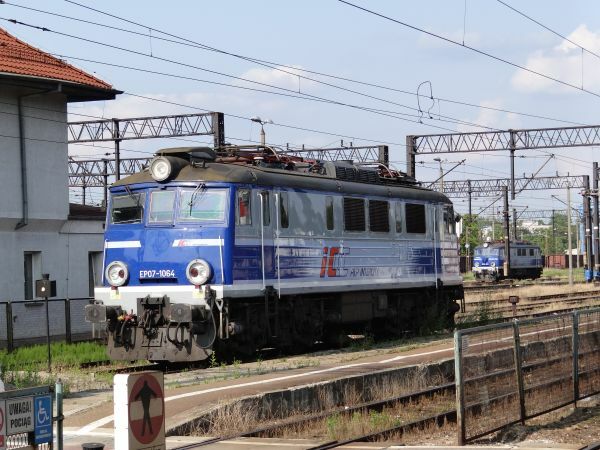 Yet another Pesa Gama locomotive at Korsze. The picture shows quite nicely the fairly special design of the locomotive. Picture from Korsze 19.8.2017 by Marek Graff. 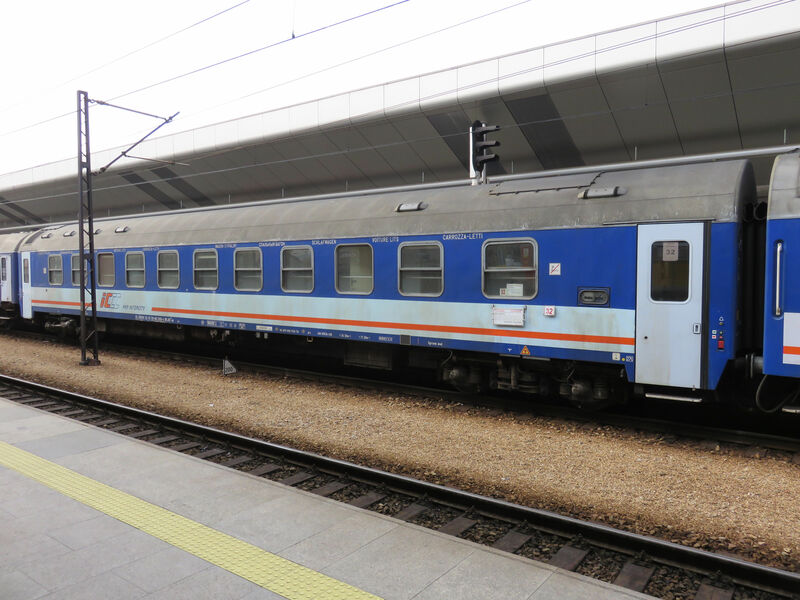 Although some newer trains are already available, the combination of an old EP07 / EU07 with old East German "Halberstädter" coaches is still in 2017 very common in InterCity traffic in Poland. Picture from Szczecin glowny (Stettin main station) 6.4.2017 by Ilkka Siissalo. 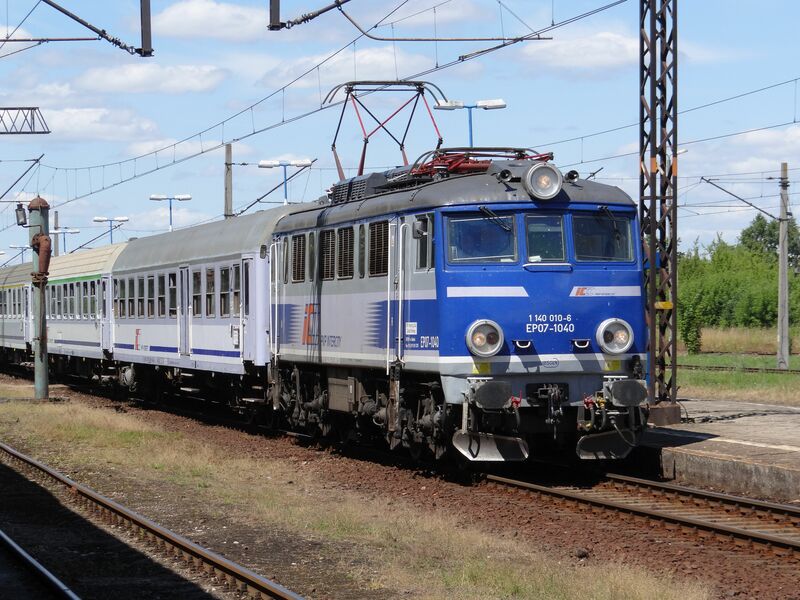 Still a very typical InterCity train of today's Poland, an old EU07 with a couple of DDR built Halberstädter coaches. PKP InterCity would still need desperately new rolling stock. 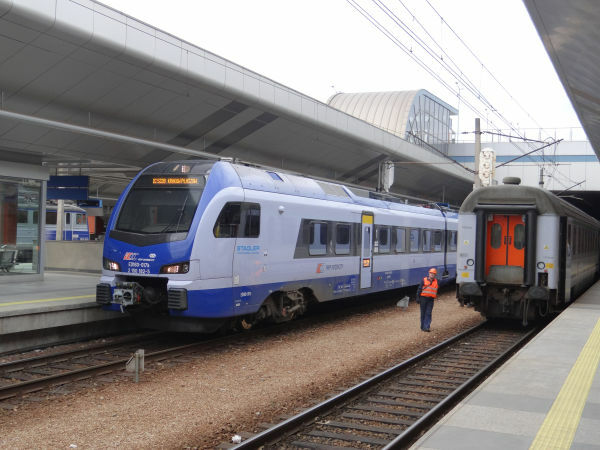 Notice by the way how both pantographs of the old locomotive need to be used whilst the operating currency in Poland is only the modest 3 kV DC. Picture from Krakow Glowny 16.4.2016 by Ilkka Siissalo. Another similar typical Polish InterCity train with an old but modernised EP07 locomotive and old DDR built coaches is here just about to stop at the station of Grajewo. Picture 27.6.2015 by Ilkka Siissalo. Same train as in the picture above, but here seen from a tall bridge. Picture at Grajewo 27.6.2015 by Ilkka Siissalo. 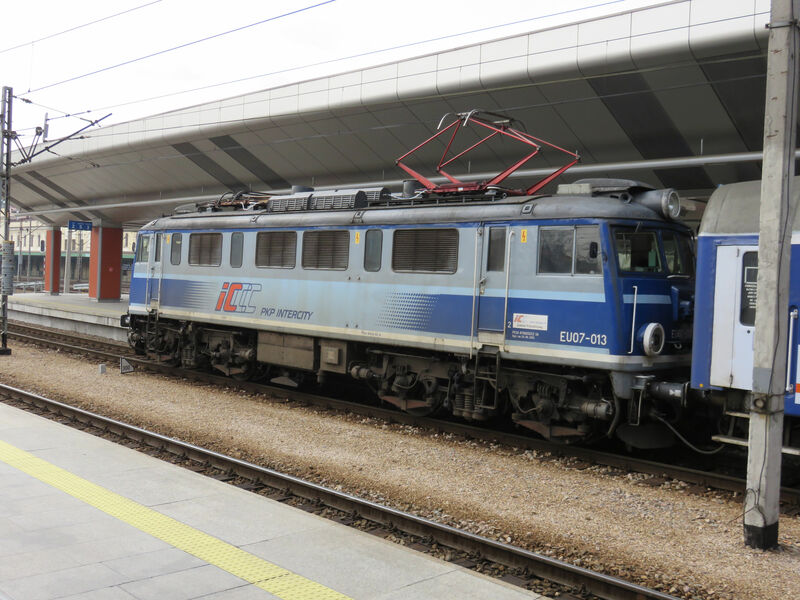 A type EP09 locomotive of PKP Intercity. These locomotives were built 1986-1997 by Pafawag in Wroclaw. 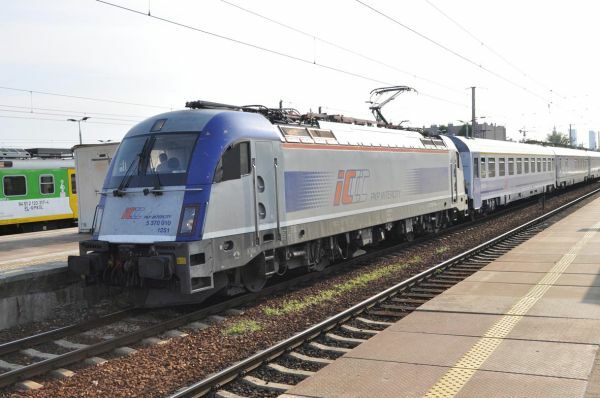 It is a 3180kW strong passenger train locomotive with a max speed of 160 km/h. It can operate only on 3kV DC. 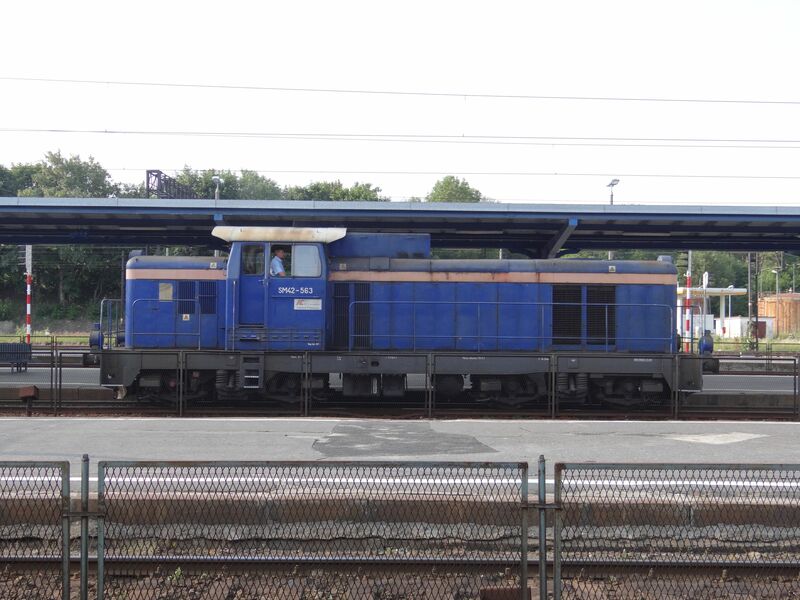 Pafawag calls this type 104Eb as there are multiple subtypes of the locomotive. Picture from Krakow Glowny 5.3.2015 by Ilkka Siissalo. 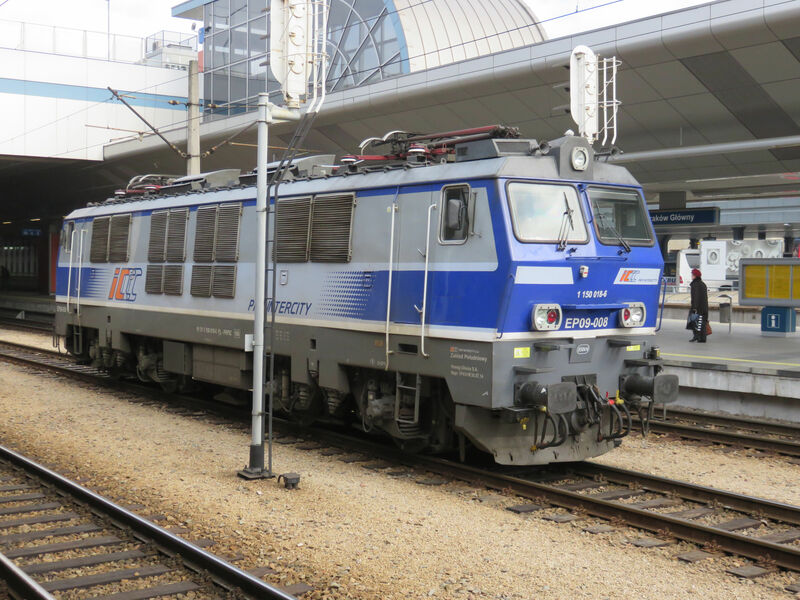 Also this one is an EP09 registered to PKP Intercity, but it has a more rare painting scheme. Picture from Krakow Glowny 5.3.2015 by Ilkka Siissalo. 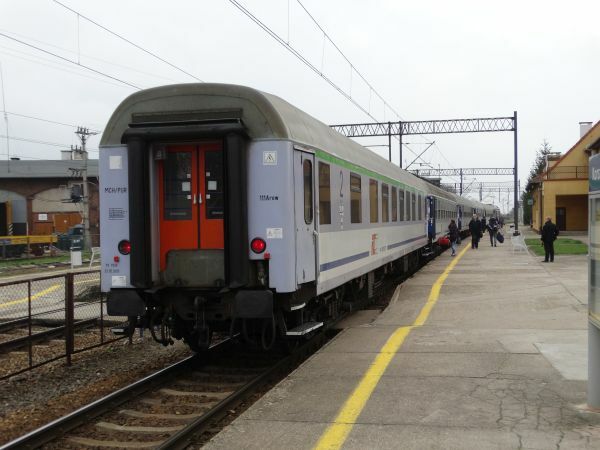 Sleeper coaches of PKP Intercity on the route Krakow - Kolobrzeg. Picture from Krakow Glowny 5.3.2015 by Ilkka Siissalo. 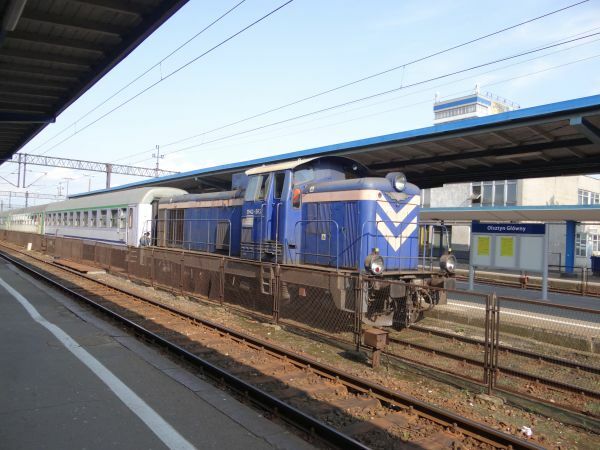 An EU07 locomotive ready to pull the sleeper train of PKP Intercity from Krakow to Kolobrzeg. Picture from Krakow Glowny 5.3.2015 by Ilkka Siissalo. Two EP07 locomotives. The EU07/EP07 locomotives are commonplace in Poland. EU stands for electric, universal and EP stands for electric, passenger. The EP07s are later modifications of what used to be EU07 machines and the only difference is different traction engines and a different gear ratio. 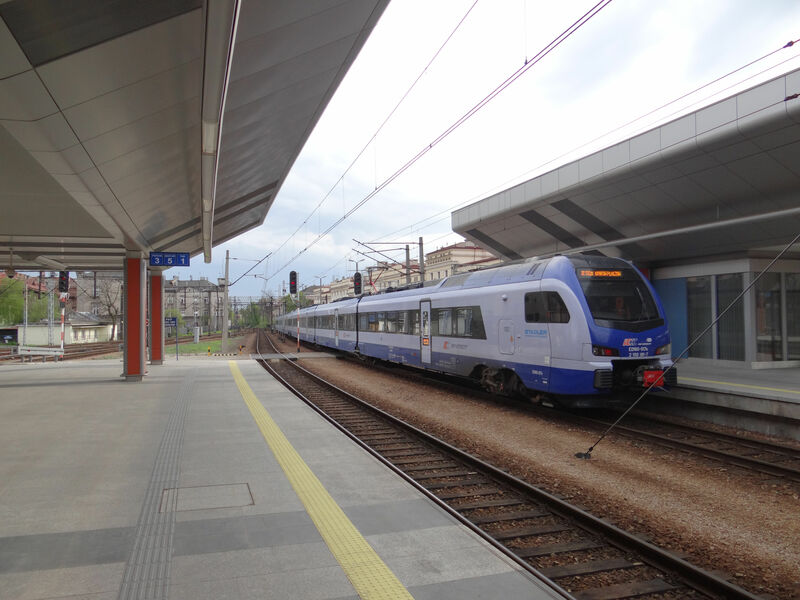 Picture from Olsztyn station 29.6.2013 by Ilkka Siissalo. Old style painting in one of the PKP Intercity coaches. These coaches are of the "Halberstädter" type made in DDR and this is the original painting of a 1st / 2nd class coach. Picture by Krakow Glowny 7.3.2015 by Ilkka Siissalo. 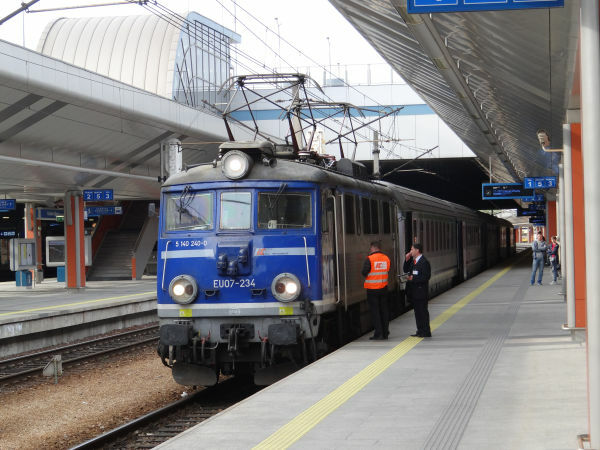 Much of the long distance or express trains of Poland still today are operated with old communist time coaches built in the former DDR. Some have already been painted in PKP Intercity's new colours, some still use the old PKP livery of old times. Here an old SM42 switcher diesel is bringing in a rake of East German made old coaches and then an equally old EP07 is picking them up. Picture from Olsztyn 29.6.2013 by Ilkka Siissalo. Old coaches, new locomotive. 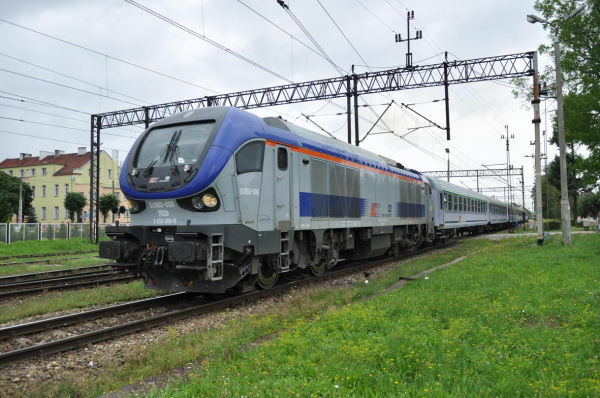 This locomotive is a third generation Siemens Taurus codenamed ES64U4, known in its native country Austria as Br 1216 and in Germany as Br 193. In Poland it is called EU44. 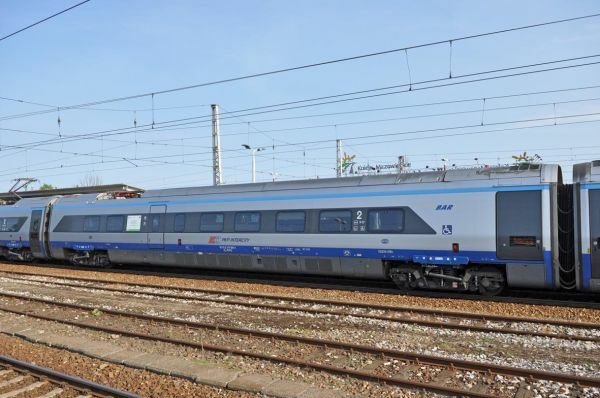 It is a 230 km/h fast (at 25 kVAC) multiple electric system locomotive which can run under s kV DC, 15 kV 16 2/3 Hz AC or 25 kV AC and it has the necessary security systems for running all the way from the Netherlands via Germany to Poland. Previously these were used for example in the Berlin to Warsaw EuroCity trains. 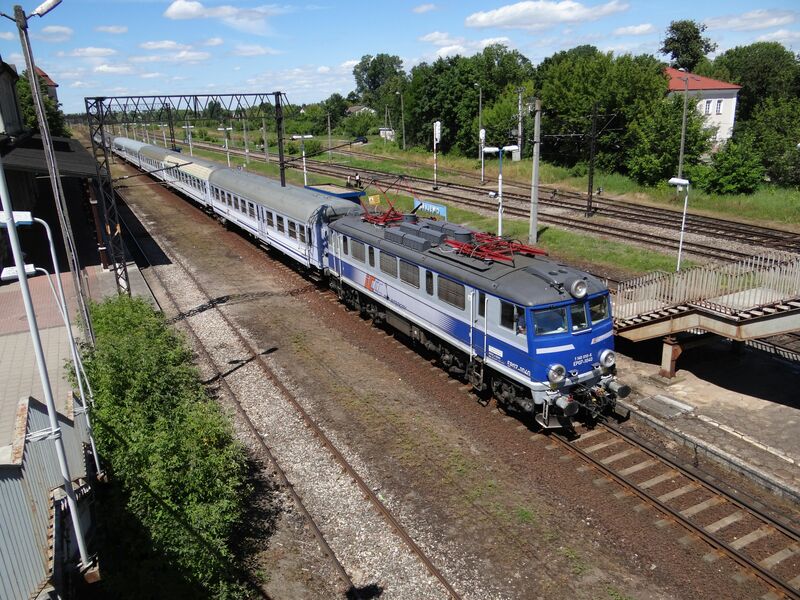 For more pictures of a Polish PKP Taurus locomotive, see our German section, part Polish state railways PKP in Germany. Picture from Warsaw west station 1.9.2018 by Marek Graff. 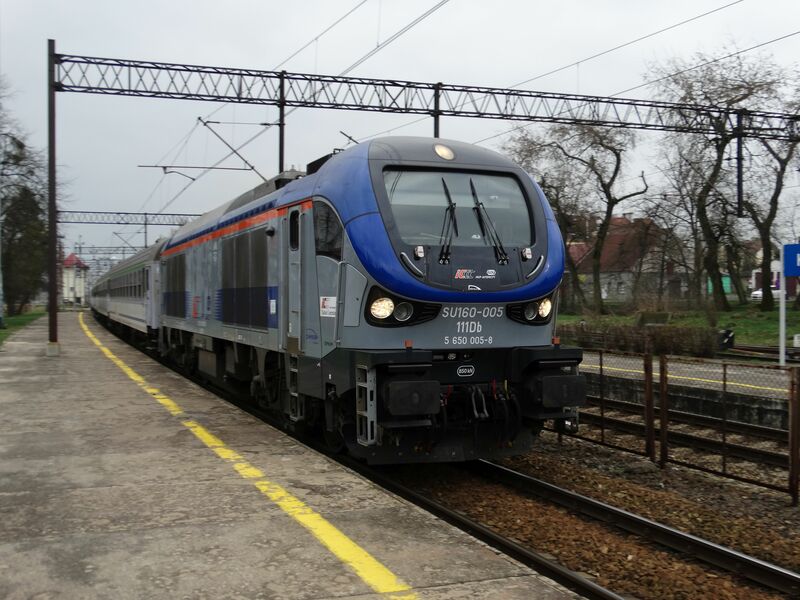 PKP is now gradually getting more and more new trains to replace the old communist time ones. Here is one example. This locomotive is a brand new "Griffin" express passenger train locomotive built by the Polish company Newag, here pulling PKP Intercity's train no 1329 to Krakow. Picture from Warszawa Wschodnia station 8.3.2018 by Marek Graff. The same old SM42 diesel switcher engine as in the picture above. A sticker by its side declares it to belong now to PKP Intercity.